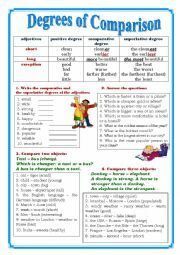 4 exercises and a grammar rule included to revise the degrees of comparison of adjectives. 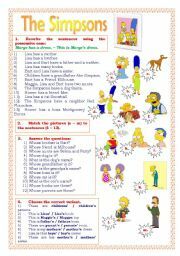 A simple text to revise the topic family and grammar: possessive case and Present Simple. 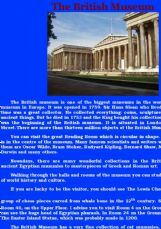 Text about schools in GB + 6 tasks (answer the q-s; unscramble the words to guess the school subjects; choose the correct answer; correct mistakes; make up q-s and guess the places at school). 2 tasks included: 1 - look at the ticket and get information about the passenger, kind of transport, departure time, destination place, etc. 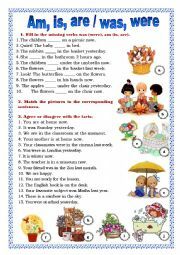 2 - complete the letter with the correct word (multiple choice). Then I asked my students to write their own letters using the one they read as an example. 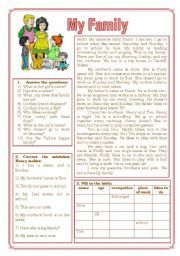 4 exercises included to practise the possessive case and the topic "Family". 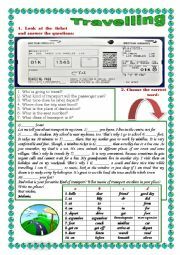 Exercises to practise forms of the verb "to be" in past and present simple. 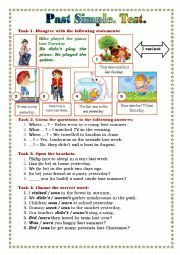 It�s a reading comprehension worksheet. There are three tasks here: fill in the missing words, true or false and answer the q-s. Key is included. 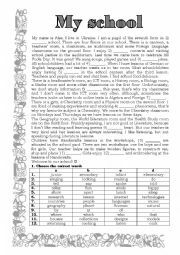 It�s a grammar test I�ve made for my pupils. They sometimes misuse the verb "to be" and the notional verb in Past Simple. 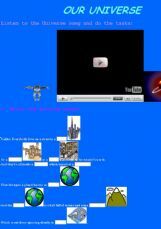 So, we practised a lot and here�s a test to check their knowledge. Unfortunately, the document is too big, so I�ll upload two variants of the test separately. 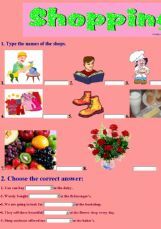 Choose the correct answer to the question, revise the vocabulary on the topic "Shopping". 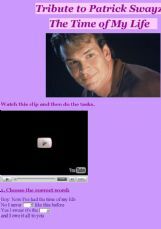 Read the information from advertisements about different goods and decide which product it is referred to. 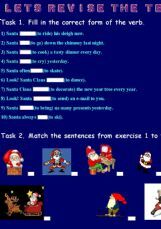 Revise to be and Christmas vocabulary. Let�s revise Present, Past Simple and Present Progressive tenses and also some Christmas vocabulary! Happy holidays to you, dear friends! 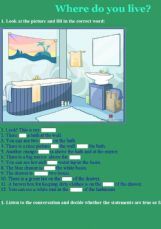 Describe the bathroom (insert the correct word), then listen to the conversation and deside whether the statements are true or false. 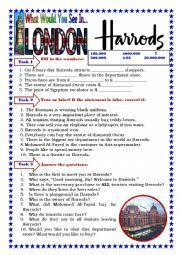 Three exercises to revise topic "Shopping": guess the shop, choose the correct answer and listening comprehension. Hope, your kids will enjoy watching this cartoon and revise such topics as "Time", "Food", "Clothes" and also grammar (some or any). The second part of this amazing cartoon. 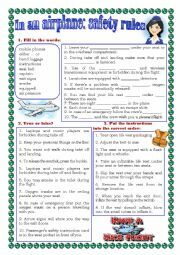 Here you may practise Present Progressive and Past Simple tense, the formation of adverbs, usage of the words "some�, "any" and "no".